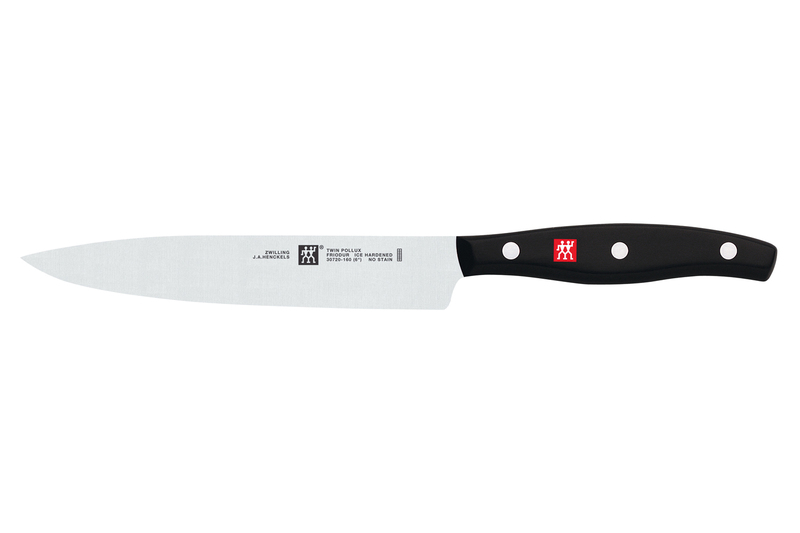 The Zwilling Twin Signature 6 inch sandwich or utility knife is the ideal knife when you want to thinly slice a ripe tomato without crushing its soft interior. This useful knife is stamped from a single piece of top quality stainless steel, which makes it slightly lower priced than a forged knife. Crafted in Germany, It has the Henckels cutlery lifetime guarantee. For a basic utility knife that's sharp, durable and low cost, Henckels Twin Signature is a practical choice. It has a lower price because it's a stamped knife, a less costly manufacturing process vs a forged knife. A stamped knife blade is also slightly thinner than a forged blade and may require somewhat more frequent sharpening. The edge of this sandwich knife is crafted by lasers for precision cutting and extreme sharpness. As with all good quality knives, the Twin Signature line has a full tang, or part of the blade, that extends all the way to the end of the handle. This helps to balance the knife so it's easy and comfortable for you to use. A full tang also makes it extra sturdy. A thoughtful ergonomic design makes the handle quite comfortable for you. Count on the same quality, care and Lifetime Guarantee for Twin Signature as with all forged knives from JA Henckels. Rockwell hardness is 57. The higher the number the harder the blade. MetroKitchen.com recommends washing your knives by hand; then immediately drying them. Do not let your knives soak in water. Avoid cleaners containing bleach or citrus extracts. They may stain the surface of your knives. Always use a wooden cutting board to preserve blade sharpness. Cutting on hard surfaces such as stone, metal or glass quickly dulls blades. To maintain a sharper cutting edge, use a sharpening steel, preferably each time after you've used a knife. It's best to store your Henckels knife so its edge and your fingers are protected, preferably in a block or in-drawer knife tray. We suggest using a meat cleaver when you need to cut through bone, otherwise you can damage your knife blade. Made in Soligen, Germany, knife capital of the world.